An appropriate phrase for Sandeep More’s recent musings. A labyrinth connotes an irregular complex structure. It is a maze of secret chambers through which one finds a way – of getting lost in the entanglement of spiraling forms or floating on the enlargement of a singular spatial form. As you breathe the space and weave through it’s labyrinthine constructions - all of this and more forms a parallel to the process of the artist Sandeep More’s musings. We all have our labyrinths, as we travel through the ones created by time and society, or create newer ones based on our individual psychological, philosophical, logical and intuitive perceptions. With a step into both these mazes - belonging to archaic and modern times - an artist constructs his own lattice; bridging them into a complex structure of thought, form and feeling. The feeling remains the most constant, yet invisible thread of all creations. The reason behind art springs from this emotive link - elevated by thought into newer expressive forms. In Sandeep’s works, the element of feeling shapes itself with repetitive layering of pigment - forming smoggy lines of thought that construe an unusual dimension, possibly beyond the fourth. A line is a definite construction of thought, but these smoggy lines denote a shedding of these thoughts - in an attempt to venture deeper into newer dimensions of pictorial experience. Cubism was a result of this line-thought construction. Sandeep’s attempt goes beyond this, creating a new dimension altogether. The construction of these smoggy lines finds it’s roots in an age-old tradition of metamorphosing. The process can be witnessed beyond the pictorial sense, as for Sandeep it hints towards shedding orthodox ideas and rigid systems of moral thinking. He breaks the circle only to understand the sphere. These illusory lines began as constructions of a square, but found themselves in a space impregnated with infinite dimensions - that finally conceived itself into a dimensionless space. Sandeep’s insight into the future gave him the strength not only to revolutionize conventional forms and structures of pictorial expressions, but also to infuse them with his own belief in contemporary thinkers like Swami Vivekananda. The form derived was definitely contemporary in style and nature. But it is not just a sensory analysis, instead, it combines with a deeper introspection - an analysis not rooted in mental conceptions, but in intuitive perceptions. In the two labyrinths, that of an ancient belief (all is Spirit and emanates itself as Light) and that of various contemporary perceptions (that light makes visible all things) - it is the light that we paint, which gives dimension to a canvas. It is the subjective and objective analysis of light from which the isms emerged; a discovery for scientists, a realization for the seeker-philosopher, a subject for the artist – all of which entwine to form a labyrinth of light spaces wherein constructive lines rise up into clouds of colour to form smoggy lines, which disappear to enter into angular dimensions of light – metamorphosing the primordial and the modern to construe the now. A light balloon floats in air fused with the light of the Sun. It traverses the vast spaces of air and ether, halting at neither, only to plunge deeper into the spaces of light-sound-vibration. A sound that is unheard of – it is the sound of space. 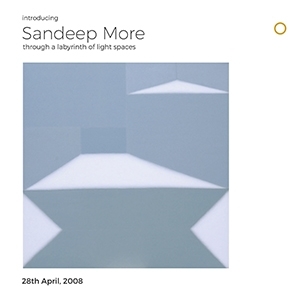 Sandeep not only perceives this sound, but analyses it with his medium of paint, pigmenting it repetitively like coating a canvas, creating a matrix of light. Sieving through the riddles of spaces like a wizard, he navigates the intricate dimensions of space, to form a molecular assemblage of light-pigment. The resonance of this colour cluster gives birth to a range of colour tonalities, strung together to form a unique opaqueness with varying densities. The sharpness of the colour is mellowed by an external listening of Indian Ragas or Marathi Devotional songs that add the madhur bhava required in a painting. Sound plays the role of a catalyst in the case of Sandeep’s work. It is not the subject, but a means of reaching the subject, which for Sandeep is - everything that is touched by light. Weaving through the light-space-vibration, he surpasses their intermediate barriers floating in an image of soundless space illumined by its own enlightenment. The labyrinth is at last broken — leaving behind the coated canvas to reveal its own dimensions for us to traverse. The process begins, engulfing us with a series of thoughts, fears and anxieties that submerge into the depths of these dimensionless spaces. Relinquishing thought to enjoy the freedom of no-thought, Sandeep takes us through a labyrinth of light spaces – a joyous ride.